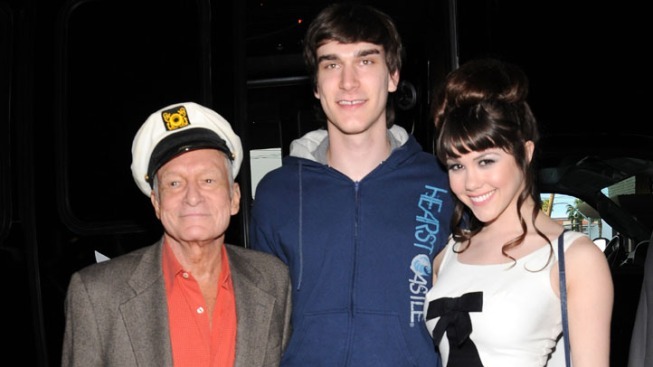 Hugh Hefner, Marston Hefner and Claire Sinclair pose together at Hugh Hefner's 85th birthday celebration in Las Vegas on April 9, 2011. Soon after Hugh Hefner's 21-year-old son was arrested on suspicion of domestic violence, the 2011 Playmate of the Year sought a restraining order against him Monday. According to Lt. Jari Faulkner, 20-year-old Claire Sinclair — apparently Marston Hefner's on-again, off-again girlfriend — sought the order against him from Pasadena police. Marston Hefner was arrested Sunday about 10 p.m. at his Pasadena home in the 100 block of West Del Mar Boulevard, said Lt. Rick Aversano, a watch commander with the Pasadena Police Department. Marston Hefner has since been released on $20,000 bail, Aversano said. Pasadena police would not identify the alleged victim, although Marston Hefner reportedly shared the home with Sinclair. "We responded to a fight between boyfriend and girlfriend," Aversano said. "After checking the victim, officers confirmed minor injuries to the victim consistent with a recent assault, but the victim was not (hospitalized)."